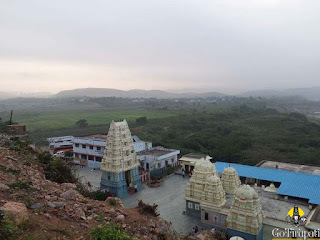 One Stop Site for Tirumala Tirupati. GoTirupati is a Trip Adviser for your Journey. We here guide Devotees with Up-to-Date Tirumala Tirupati Information which ease Tirumala Journey. As mentioned in the Brahanda Purana, Lord Vishnu in the form of Matsya (fish) recovered Vedas from the demon Somakasura, who had stolen Vedas from Brahma. Vedas took the form of Humans and praised Lord. Vedas in Human form (Veda Purusha) requested Lord to reside on their heads for permanent. Impressed Lord, replied that "Veda Purusha wish and River Krishnaveni wish to perform daily abhisheka will be fulfilled during his Narasimha Avatar" till then he asked them to reside under the waters of river Krishnaveni as Saligrama stones. Lord Narasimha Swamy an incarnation of Lord Vishnu self-manifested on Vedadri hill after killing the demon Hiranyaskha. Swayambhu Narasimha called by Jwala Narasimha. As per the folklore, Sage Vedavyaasa directed Sage Rishyasrunga and other sages to perform their penance near Vedadri hill. While in search of a suitable place, they heard the Sounds of Veda Mantras and discovered the Swayambhu Idol inside the Cave. With the blessings from the Lord Narasimha, they did penance here and attained salvation. Yoga Narasimha was installed by the Sage Rishyasrunga. It is said that Brahma installed Saligrama Narasimha Swamy here in the mid of the river Krishna. It is said that Lord Brahma installed Saligrama Narasimha Swamy in the river Krishnaveni. GoTirupati © Copyright 2015, All Rights Reserved. Simple theme. Powered by Blogger.